Street artists are geniuses who can show their creativity virtually anywhere. All they need is a place to showcase their work and they are every-ready to go. From graffiti to music, bringing such artwork to life is neither easy nor cheap. While gallery artists are paid huge amounts, street art—while appreciated—does not get paid enough. This happens not because street art is not valuable. But because majority of people carry credit and debit cards, which hamper audiences who want to tip the artists. The first method involves using a cryptocurrency wallet—such as Bitcoin, Ethereum, Litecoin, PIVX, etc. The wallet address is encoded into a QR Code. 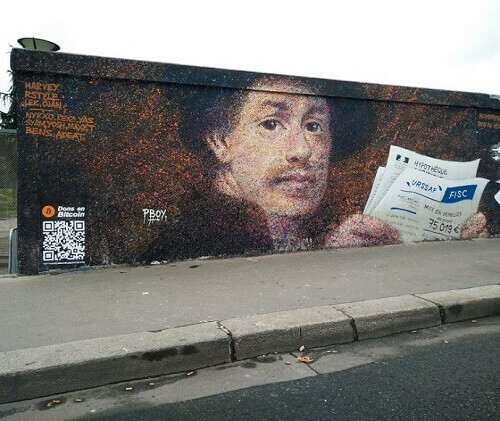 French artist Pascal ‘PBOY’ Boyart has already earned USD 1,000 worth of donations using a cryptocurrency payments QR Code in his artwork. 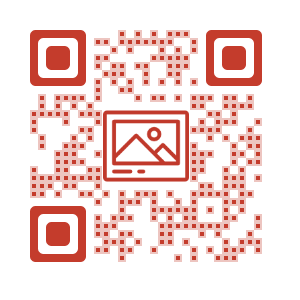 The QR Code when scanned prompts users to make donations using Bitcoin, Ethereum, and Litecoin. Alternatively, artists such as musicians can carry a cryptocurrency QR Code with them. Also see hoe one can create an interactive wall mural with QR Code. In Jul 2018, City of Barrie partnered with Downtown Barrie and Ontario Musicians Co-Operative. The aim was to evolve the former street performers program. In this, audiences can tip the musicians with digital currency— PIVX. People who want to tip the performer can scan a QR Code on the signs carried by musicians. Also see how QR Code usage is soaring. The other method is similar but instead of cryptocurrency, the street artist can simply use a Paypal QR Code. Paypal is a widely popular payment method and users also have the option to pay via debit/credit card. This method is useful if your work is legit and you have taken the right permissions from the law. See how to create a Paypal QR Code. With the help of QR Codes and payment wallets, street artists can now earn from their creations. What helps more is that every person now has a smartphone and a digital way to make payments. Street artists finally have an option to not only get appreciated but also to earn a living they deserve. Generate a Paypal QR Code to start accepting donations for your artwork. Free Trial. An avid reader who loves everything tech-related. When not being poked by his boss about his impending deadlines, he loves watching movies or spending time with his family and friends.